While on an RV camping trip, you may sometimes wish you could bring more of the conveniences of home along with you. One such example is being able to get the amount of water pressure you want without worrying about using up too much of your supply. The Phoenix Airfusion Handheld Shower Kit alleviates part of that problem by providing higher water pressure while actually using less water. Perhaps you wish to save on the costs of using more water, in which case this shower kit can help with that too. The Phoenix Airfusion Handheld Shower Kit uses a specific technique to make this possible. Through the use of a vacuum valve in the shower head, air bubbles are made and then pushed out along with the water. The forced air compression allows you to have greater pressure while showering, while still using up to 20% less water. The kit comes with a 60″ hose, a hose guide and a shower bracket. These shower kits are available in several different finishes to fit your style of interior décor, including brushed nickel, clear, white or chrome. Using this shower kit not only saves you from having to worry about your water supply. Since it consumes less water, it also saves you money and is a more environmentally conscious plumbing solution. The Phoenix Airfusion Handheld Shower Kit is not only ideal for use in RVs, but can also be installed in your home shower as well. 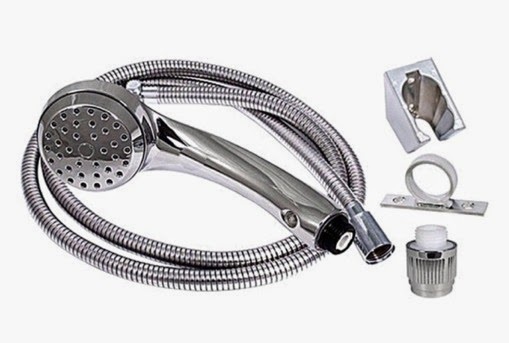 With this shower kit, you will be able to have more of the convenience of a home shower while you are away from home.